The other week I had some vacation time and took a trip to Bournemouth. The aim of this little adventure was to seek out a Vegan meal at one of several restaurants/cafes which I have been hearing so much about on Twitter (@Dorset_vegan is the one to follow). It was a toss up between Zoukinis or Mad Cucumber with Zoukinis being the loser since it is closed on Mondays. Excuse the fuzzy ipod pictures but I forgot my camera and it was a grey and wet Monday. 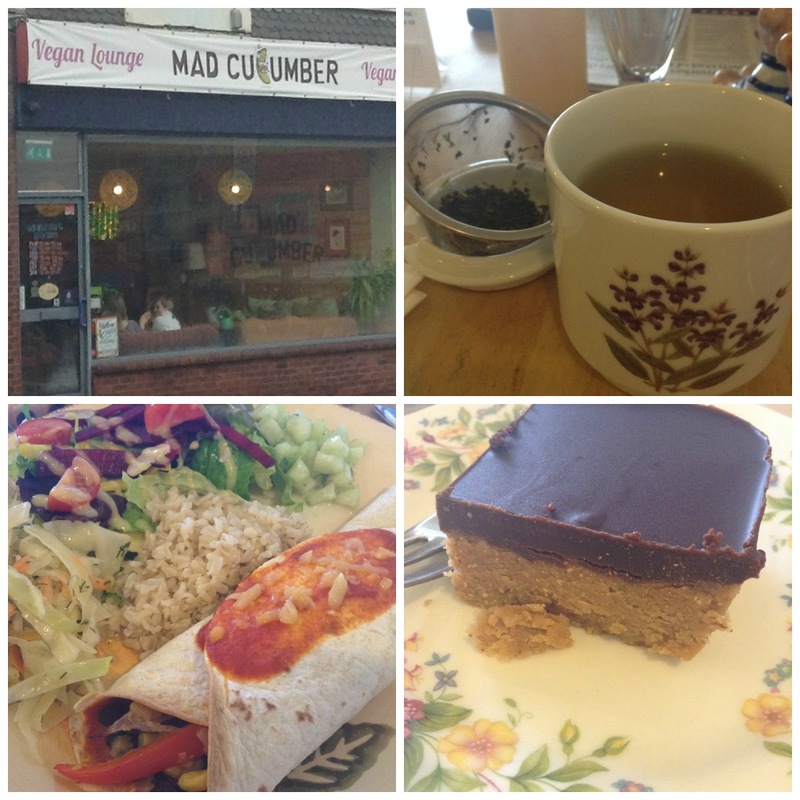 Mad Cucumber is a reasonable sized, light and spacious cafe, with homely furnishings. Staff were friendly and the menu presented on chalkboards on the wall behind the counter. After I distracted myself from eyeing up the cakes on display, we ordered enchiladas. My boyfriend and I both enjoyed our meal. The enchilada was full of veggies, beans, "cheese" and the accompanying side salads were delicious. When dining out dessert is usually not an option for me so I could not resist ordering a slice of Peanut Butter bar. It reminded me of PB cups and went down a treat. I did ended up sharing it with my other half because it was rather rich and indulgent. If you find yourself hungry in Bournemouth and you like simple, homely vegan food in a relaxed environment, then I recommend a visit to Mad Cucumber. I liked it and I would happily return for another meal and a slice of cake. Yummmmmy. Peanut butter everything in my mouth please!